The Textiles Ministry will firm up the draft of the National Textiles Policy within the next 15 to 20 days. 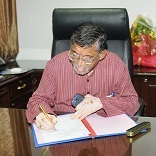 NEW DELHI: The Textiles Ministry will firm up the draft of the National Textiles Policy within the next 15 to 20 days, Textiles Minister Santosh Gangwar said on Thursday. The key objectives of the new Textiles Policy include developing a vision statement of the textile sector for the next decade to treble market share from the current 4 per cent in the next decade. Besides, it also aims to formulate a stable and fibre neutral raw materials policy to benefit the entire value chain and to address modernisation and mechanisation needs of the textile industry. “We are having discussions (on the new National Textiles Policy) and the draft will be ready in 15—20 days,” Gangwar told PTI. In December last year, the previous government constituted an expert committee to review the National Textile Policy 2000 and formulate the National Textile Policy 2013. The existing National Textile Policy 2000 was framed about 13 years ago. Since then, the industry has undergone various changes on the domestic and international front. The domestic textile industry has seen large scale modernisation and technological up-gradation in the last decade and faces new challenges. In the international trade scenario, while the export quota regime has been removed in 2004, recent trends in the global textile industry offer an enormous opportunity to Indian industry to enhance its share in world trade with a supportive policy framework. Government aims to formulate a new improved Textile Policy to address concerns of adequate skilled work force, labour reforms, attract investments in the textile sector, and to provide a future road map for the textile and clothing industry. The New Textiles policy also envisages recommendations for development of a skilled work force and for creating world class infrastructure for Textile Parks along with a conducive investment environment. This apart, the new policy aims to formulate recommendations for developing and modernising the power loom and handloom sector and to address the proliferation of environmental concerns along with assessing the credit requirements of the textile sector.